The Chinese government on Tuesday denounced as "provocative" and a threat to "regional peace and stability" the passage of a U.S. warship through disputed territorial waters in the South China Sea. 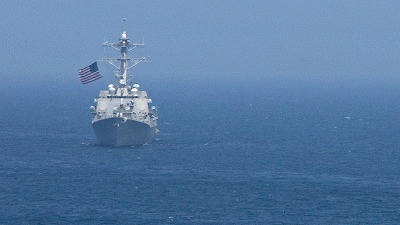 Quoted by state television, the China's Vice-Foreign Minister Zhang Yesui said the behavior of the USS Lassen -- a U.S. Navy destroyer which passed within 12 nautical miles of a pair of artificial islands under construction by China -- was both "illegal" and "extremely irresponsible." According to the South China Morning Post, Yesui summoned U.S. Ambassador to China Max Baucus to discuss the matter in person. "The action by the U.S. warship has threatened China's sovereignty and security interests, endangered the safety of personnel and facilities on the islands and damaged regional peace and stability," said Lu Kang, a spokesperson for the foreign ministry. Kang urged the U.S. government to "correct its wrongdoing immediately" and to avoid further "dangerous and provocative actions." 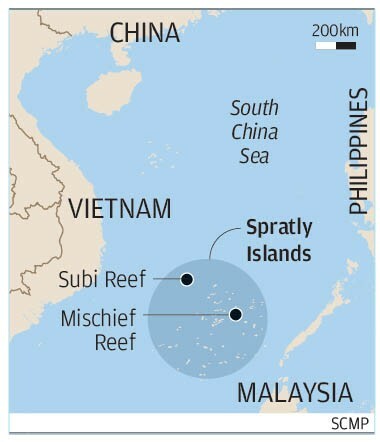 "Since 2013, China has accelerated the creation of new outposts by piling sand atop reefs and atolls then adding buildings, ports and airstrips big enough to handle bombers and fighter jets -- activities seen as an attempt to change the territorial status quo by changing the geography. "Navy officials had said the sail-past was necessary to assert the U.S. position that China's man-made islands cannot be considered sovereign territory with the right to surrounding territorial waters." Despite support for this kind of U.S. military action by some of its regional allies who dispute Beijing's claims and worry about a larger Chinese footprint in the South China Sea, experts warn that the U.S. is playing a very dangerous game by trying to assert itself militarily so far from home. Speaking from Beijing, retired Rear Admiral Yang Yi, a researcher at the Institute of Strategic Studies of the People's Liberation Army National Defense University, told the Washington Post that such provocations could seriously damage U.S.-China relations and may encourage China to speed up construction on the islands, and possibly also their militarization. "The act is reckless, dangerous and irresponsible," Yi said. "It shows the United States has the mentality of the big brother but the temper of a child. If it becomes a regular thing, military conflict in the region is inevitable and the U.S. would be the one who started it." And Ian Storey, a South China Sea expert at Singapore's Institute of South East Asian Studies, explained that Washington's decision to deploy a large warship armed with cruise missiles and other advanced weaponry, as opposed to a smaller vessel, was designed to send a strong signal to Beijing.